This has been the 2nd greatest bull market since World War II. The chart below from The Leuthold Group shows the performance of the prior 12 bull markets along with the current one. If the bull market continues in the intermediate term, this bull’s performance can beat out the one in the 1950s. 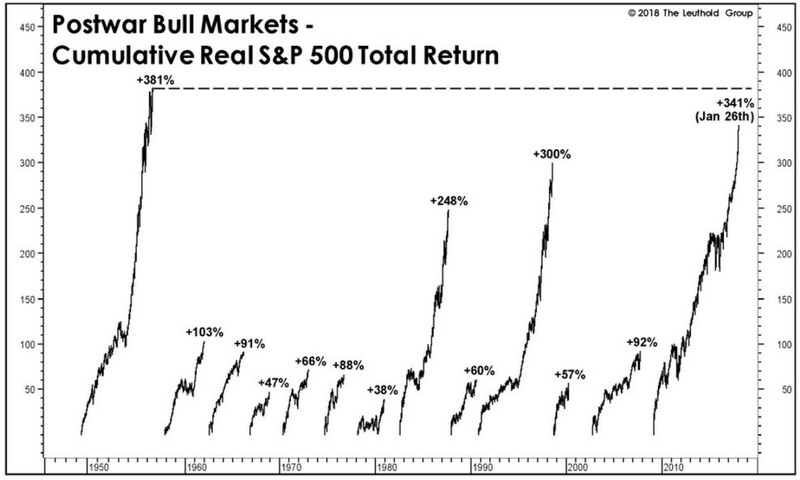 This long bull market has been brought about by the fact that this has been a long business cycle. 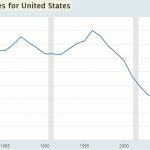 This occurred because it took a while to recover from such a devastating recession especially since the economic growth has been so slow. The Fed’s easy monetary policy has also helped the situation, even with the current hike cycle which has been the slowest hike cycle since 1977. Another big reason for this rally, which we will elaborate on in this article, is the expansion of the tech sector. In the 1990s, most tech stocks were in a speculative bubble because the companies had no earnings to support their valuations, while now they are for real because they generate massive profits. There are still problem stocks of course, but we are discussing the sector as a whole. Before we get into the tech discussion, recognize that this chart doesn’t mean stocks will fall because the current run will reach a ceiling. Economic growth, profit margins, and monetary policy determine stock prices. 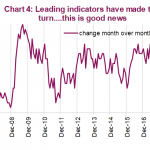 If the Goldilocks scenario stays in place, stocks will continue to go up regardless of the fact that the other bull markets have ended quicker and have been smaller. The tech sector is now the biggest sector in the market as most of the world’s largest firms are involved with the mobile internet. The internet is so pervasive that even traditional players heavily utilize the internet to do business. Many large firms have smartphone applications to reach their customers. Many investors criticize redefining traditional firms by calling them tech because that definition often comes with a hefty multiple. While it’s fair to question why a traditional firm should get a higher multiple just because it has an app, that doesn’t eliminate the point that all firms utilize the internet. 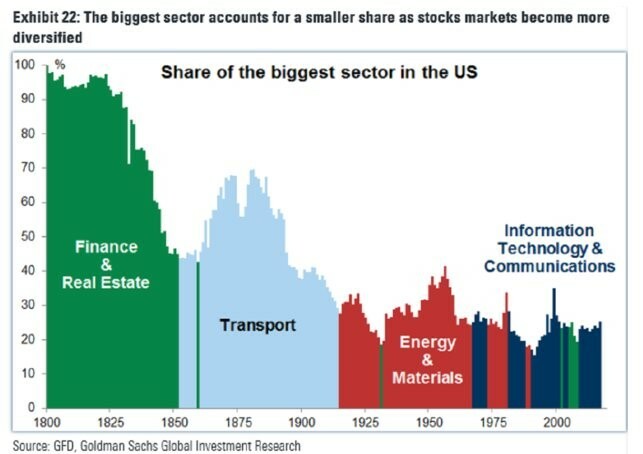 The chart below from Goldman Sachs shows the historical market share shifts of the largest sectors in America. The country went from being dominated by finance, to transportation, to energy, to tech. The tech sector is being redefined because of the changes most firms are making. The guidelines for each sector will be even more difficult to determine in the future. Because of the changing guidelines, which are much more important now than ever before because of the prevalence of ETF investing, tech’s market share will be underrepresented in charts like this in the future. However, it’s a foolhardy claim that the prevalence of the internet will somehow disappear because this tech leadership is a bubble. These periods of changing sector dominance are a reflection of human advancement rather than a series of bubbles. If another advancement surpasses the internet, it doesn’t mean current tech leaders are bubbles now. There will always be firms which fail to properly position themselves for the future. Those are simply bad investments, not bubbles. In discussing the tech sector, it’s important to understand which firms are in it. As we mentioned, the lines have been blurred. Since ETF buying is a huge business and tech is the largest sector in the S&P 500, it’s critical that the proper lines are drawn to determine which firms fit in each category. The chart below from Goldman Sachs shows the changes which will be made effective as of September 28th according to the Global Industry Classification Standard. Some of the biggest members of the FANG stocks will be moving to the newly formed communication services sector. Breaking up the tech sector is great for these firms because investors can own the big internet firms and consider themselves more diversified. 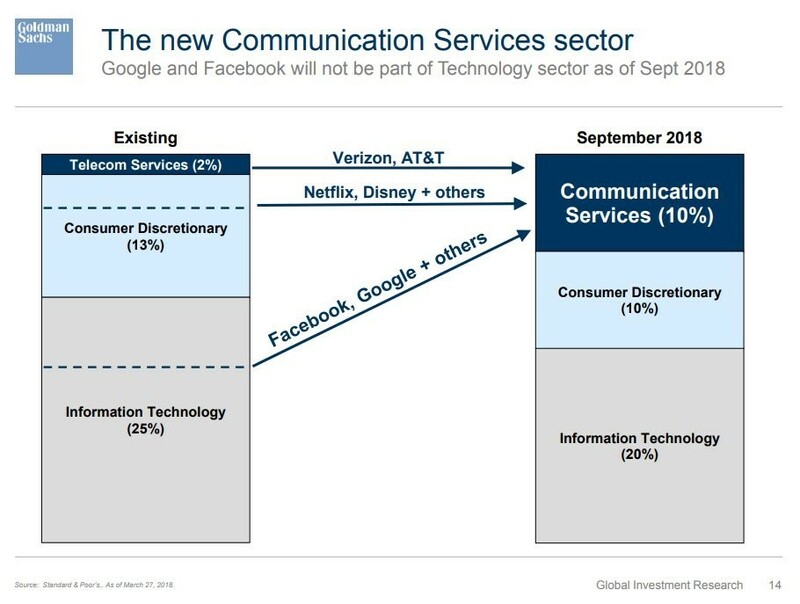 The communications services sector will also have a more concentrated exposure to some of the top internet firms. The performance of the internet stocks is very important to the current bull market. They are the market leaders. 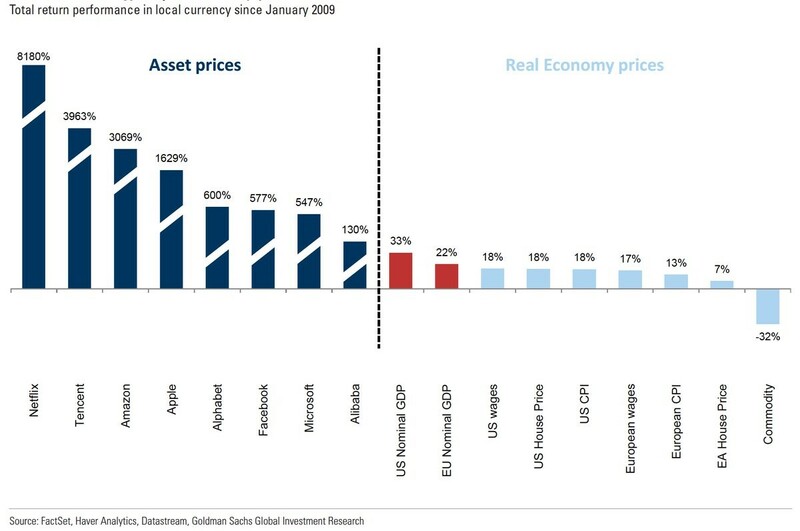 The chart below from Goldman Sachs compares the total returns of the top internet stocks with GDP growth, wages, inflation, housing prices, and commodities since January 2009. The value of these internet firms will be determined based on how they compete in an ever-changing and highly competitive landscape. Even if a firm dominates a current part of the internet, the entire business can be disrupted. In making these points, we are defending the value of the internet businesses while not claiming each firm listed in the chart will have continued great performance. When determining your asset allocation to various regions around the world, recognize that each region isn’t weighted the same. 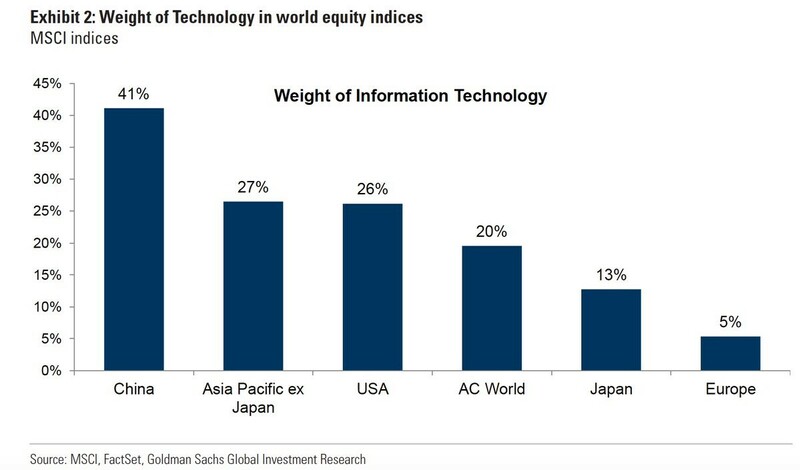 For example, moving money from Europe to China is a de facto bet on tech stocks. Everyone knows each economy has different fundamentals in terms of governments, economic freedom, demographics, and natural resources. However, when investing in a region or a country, you’re not just betting on the country. You’re betting on the corporations within it. Even if firms within Europe operate in freer economies than China, it might not be a great idea to buy European indices over Chinese ones because China has a larger tech weighting. The big tech firms are considered the leading innovators. The valuation of a country’s equity market is partially determined by sector dispersion. America, China, and emerging market Asian Pacific nations have the largest tech sector weightings, potentially making them better places to invest if you buy into the notion that tech firms innovate the most and will dominate the future. While tech is uncertain, there’s a higher chance of a tech firm having a bright future in the new economy than a materials firm doing so. 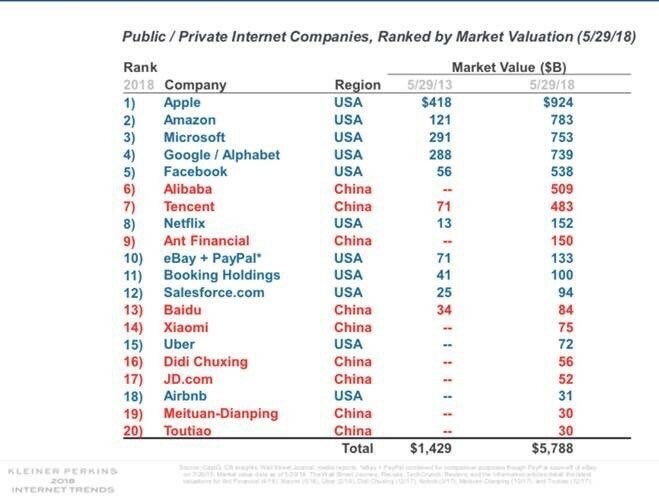 The table below from Kleiner Perkins shows the locations of the biggest private and public tech firms. As you can see, they are all in either America or China. The bull market in US stocks is being driven by the tech sector. American firms and Chinese firms dominate the list of top tech firms. The new sector groupings, which create a new sector called communication services, could increase investments to these major firms. The internet firms have seen their performance exceed other traditional asset classes. High performance doesn’t imply a bubble. 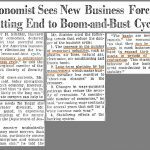 Instead the current firms will live and die off whether they can foresee the next big trend. A bubble is when an asset far exceeds its underlying value. The current value of these firms can be wrong if future profits don’t meet estimates. However, most of these firms have much lower multiples than the tech stocks did in the 1990s and they now have a track record of above average profit growth. 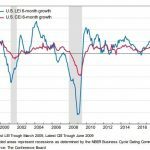 NextEnd Of Economic Growth Or More Coming?